You may have your credentials data (e.g. usernames and passwords) saved on your windows when you access a computer over networks. The credentials are actually stored files in your Windows. It could become a threat if you think you have not save any credentials data (but actually you have) and you share your computer with others. This will let the others to have a chance to log on to the computer or system (e.g. Windows Live Messenger) over the network that you have visited before on behalf of you. Therefore it is advisable to remove all your credentials data in your computer before you hand over your computer to your other people. To remove the credentials data, go to Start > Run > Type control userpasswords2 and press Enter. User Account window will be opened. Click on the Advanced tab and click on Manage Password button. 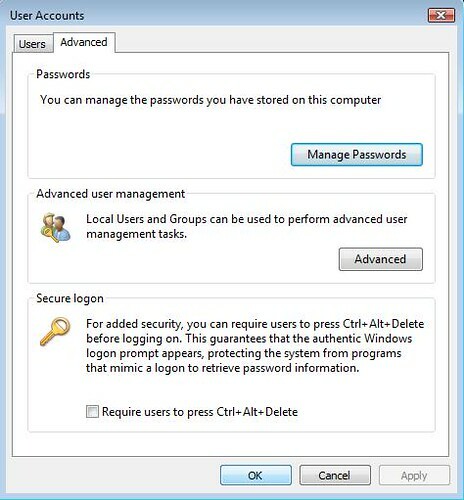 Choose the credentials information that you don’t want to be stored in the computer and click Remove. You can also backup and restore credentials data at the screen. Make sure you store the credentials at a secure place.